Nikko is a town at the edge of the Nikko National Park which is very famous for its temple Toshogu which is the most decorated shrine in all of Japan! The shrine is decorated so lavishly because it is the resting place for Tokugawa Ieyasu who founded the Tokugawa shogunate. Tokugawa Ieyasu was not meant to be the ruler of Japan, however, he went against the wishes of Hideyoshi and the battle of Sekigahara was fought. In 1603, Tokugawa was appointed the title of Shogun by the emperor and founded his new government in Edo (now Tokyo). His line of Shogun ruled for a total of 250 years! This was the start of the Edo period, a peaceful time where Japan was isolated. As you can see Tokugawa Ieyasu made a big impact on Japan so it is no surprise his tomb is so intricate. He was enshrined at Tokugawa as The Great Diety of the East Shining Light (Tosho Daigongen). The building was originally rather simple but was enlarged by his grandson. Toshogu shrine is a large complex of multiple buildings set in a beautiful forest. The architecture of the shrines and buildings here is something that is not seen elsewhere in Japan, so is rather unique. There was a lot of gold leaf and carving used on the buildings. Another thing that is unique about Toshogu shrine is that there still remain both Buddhist and Shinto elements. Shintoism and Buddhism were separated in the Meiji Period but because these elements were so entwined at Toshogu shrine the separation was never completed. 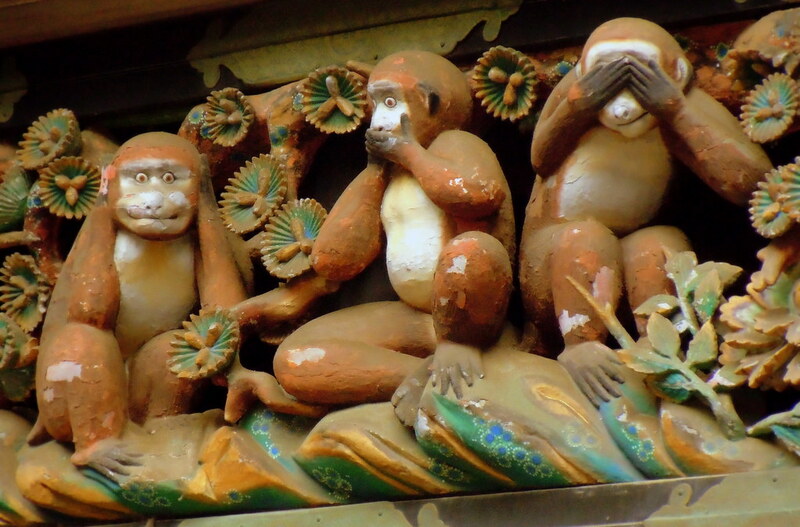 There are also three unique carvings which are very famous from Toshogu, the “see no evil, speak no evil, hear no evil” monkeys, Sozonozo elephants, and the sleeping cat. 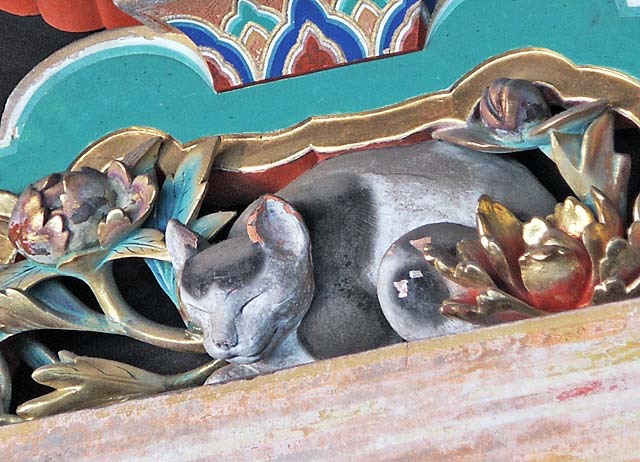 The cat carving (Nemurineko) is over the start of a long flight of stairs which lead up to the mausoleum of Tokygawa Ieyasu. The climb takes on average 5 minutes so can be quite tiring during the hot summer season, be warned! Also on the level with the mausoleum are hollowed trees encircled with rope and a crane statue. Nikko is a beautiful area of Japan to visit and Toshogu Shrine is a stunning location to visit. It is rich in history, beautiful architecture and nature. There are also other things to visit nearby, such as the mausoleum for Tokugawa’s grandson, a botanical garden and some beautiful rivers and falls. Nikko is only a short journey form Tokyo so is easily accessible for a day trip as there are hourly trains departing from Asakusa. Kegon Falls: Visit One of Japan’s Most Majestic Waterfalls this Autumn!